Providing you the best range of toilet waterproofing services, polymer water proofing services, cementitious water proofing services, floor waterproofing services, waterproof coating services and cement based waterproofing with effective & timely delivery. waterproof, and increases its strength and abrasion resistance. To give it a shine, a surface treated with Flexi-CretePCS can be buffed using a hogs hair pad of around 500-800 grit, depending on the amount of shine required. · Penetrates the concrete surface. No film or coating is formed on the surface. · Increases the hardness of the concrete surface. · Densifies and dust proofs concrete floors. · Provides better abrasion resistance. · Ready to use, Easy to apply. UV stable. Polyflex is manufacturing and providing services of entire range right from Epoxy Flooring; Car Park coating; PU Wall Coating to Construction Chemicals; Waterproofing; Chemical Resistant Coating; High Performance Anti Corrosion Coating; etc. We have a strong manufacturing and R&D base in Mumbai and we sell our construction chemicals and coatings throughout India and in other countries also. 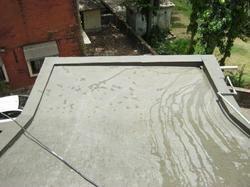 This is a polymer modified single component liquid applied bitumen elastomeric waterproofing membrane. It is fully flexible, very high water beading (water repellent ) effect and can be applied even on dry as well as wet / damp / moist surfaces. Flexible protective and waterproofing slurry. It is applied to concrete and mortar structures to prevent water infiltration and dampness. Waterproof coating to the internal faces of water tanks, slumps, reservoirs, etc. It is used for external and internal waterproofing, damp proofing, hairline crack sealing, and protection from chloride in structures like Water – tanks, Basements, Terraces and balconies , Retaining Walls etc. 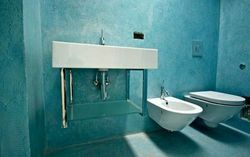 To give it a shine, a surface treated with Flexi-Crete PCS can be buffed using a hogs hair pad of around 500-800 grit, depending on the amount of shine required. Ofter cracks formed on concrete surfaces; due to thermal expansion and contraction of concrete it gives rise to water leakages through the cracks. In order to overcome this we have developed a ‘Penetrating Flexible Waterproofing System’, using a combination of our products Flexi-Crete Penetrating Concrete Sealer (PCS) and Flexi-Crete SC 300. Flexi-Crete PCS is a ready to use, water based material which waterproofs concrete structures by penetrating the concrete, by chemical reaction and Flexi-Crete SC 300 is a modified acrylic hybrid system, which is flexible in nature. Flexi-Crete PCS has many other advantages besides waterproofing, which are vital for concrete structures, and contribute towards enhancing the life of concrete structures. It is highly recommended to use Flexi-Crete SC 300 in conjunction with Flexi-Crete PCS to have an enhanced waterproofing performance. Flexi-Crete PCS makes the concrete water tight by penetrating into the surface, and Flexi-Crete waterproofs the concrete surface from the top. Since Flexi-Crete sc 300 is flexible it takes care of the structural movements and bridges the cracks on the surface which causes leakages. The combination of Flexi-Crete SC300 and Flexi-Crete PCS is very useful for ‘PT Structures’. Flexi-Crete PCS is applied using a low pressure garden spray and Flexi-Crete sc 300 is applied using a brush. Please not that Flexi-Crete PCS and Flexi-Crete SC300 both can also be used independently for waterproofing. These products individually work exceptionally well. Their use together is recommended for enhanced performance. Polyflex is manufacturing and providing services of entire range right from Epoxy Flooring; Car Park coating; PU Wall Coating to Construction Chemicals; Waterproofing; Chemical Resistant Coating; High Performance Anti Corrosion Coating; etc. We have a strong manufacturing and R&D base in Mumbai and we sell our construction chemicals and coatings throughout India and in more than 30 countries. POLY TECH WP 101 is an excellent synthetic multi-functional, UV resistant single component acrylic polymer emulsion for use in Cement Mortar / Concrete Repair material. It improves adhesion and other mechanical properties of the repair material. Instant water leakage stopping system on any substrate - concrete, steel, bitumen, Asbestos / tin, metal roof, etc. - Single component versatile high build - Can be applied even while raining, and the water leakage is stopped in few seconds. QUIKSEAL AW is a HIGH PERFORMANCE all weather and water resistant coating based on mixture of specialized acrylic polymers and is designed for emergency water stopping in terrace or roof areas / maintenance with the capability of providing durable water proofing in a single application. 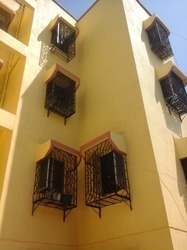 It has an unique capability of bonding on any type of substrate. Acrylic Polymer Waterproof Coating Flexi-Crete SC300 is a modified acrylic hybrid system which has many uses like waterproofing of toilets, sunken portions, roofs, swimming pools, water tanks, asbestos roofs, terraces, china chips terraces, etc. It can also be used for crack repair, and rehabilitation projects. Flexi-Crete is flexible is nature and it has a crack bridging capacity up to 2 mm. Flexi-Crete also works as an excellent bonding material. It bonds well with most construction materials such as wood, glass, metal, etc. It also helps bonding of new and old concrete mortar, repair and patch repair of concrete. Flexi-Crete helps to bond two different materials, metal and concrete, PVC pipe and concrete, wood and concrete, etc, which is common for any construction site. Cracks formed on concrete surfaces; due to thermal expansion and contraction of concrete gives rise to water leakages through the cracks. In order to overcome this we have developed a ‘Penetrating Flexible Waterproofing System’, using a combination of our products Flexi-Crete Penetrating Concrete Sealer (PCS) and Flexi-Crete SC 300. Flexi-Crete PCS is a ready to use, water based material which waterproofs concrete structures by penetrating the concrete, by chemical reaction and Flexi-Crete SC 300 is a modified acrylic hybrid system, which is flexible in nature. It can bridge cracks up to 3 mm. Flexi-Crete PCS has many other advantages besides waterproofing, which are vital for concrete structures, and contribute towards enhancing the life of concrete structures. It is highly recommended to use Flexi-Crete SC 300 in conjunction with Flexi-Crete PCS to have an enhanced waterproofing performance. Flexi-Crete PCS makes the concrete water tight by penetrating into the surface, and Flexi-Crete SC 300 waterproofs the concrete surface from the top. Since Flexi-Crete SC 300 is flexible and takes care of the structural movements and bridges the cracks on the surface which causes leakages. Flexi-Crete PCS is applied using a low pressure garden spray and Flexi-Crete SC 300 is applied using a brush. Please note that Flexi-Crete SC300 can also be used independently for waterproofing. These products individually work exceptionally well. Their use together is recommended for enhanced performance. Looking for Waterproof Services ?